I grew up with horses and dogs, and the best technique I’ve found for breaking through resistance from either species is redirection. Pulling back on the reins is unlikely to stop a bolting horse; but redirect all of that forward momentum into a tight circle, and you’ll stop your mount safely. Likewise, punishing a bored and frustrated dog by confining him to a kennel after he shreds your favorite shoes will only amplify the boredom and frustration that drove him to gnaw on shoes in the first place. A better, more productive approach is to redirect all that pent up energy into some sort of physical activity. Teach your dog to catch a Frisbee, run an obstacle course, or track a scent; and he’ll be too physically and mentally exhausted to destroy your things while home alone. I’ve experienced resistance of my own in the form of a massive and seemingly unmovable creative block this past year. My life changed dramatically and irrevocably last October when I got married. Merging two separate households and lives was surprisingly easy for my husband and me, but the one thing I’ve struggled to integrate into my married life is my jewelry craft. I’ve made countless starts on jewelry projects over this past year, and most of them ended up in my scrap bin. I’ve finished a few pairs of earrings, but none to my satisfaction. And then I had an epiphany while thumbing through the summer 2014 edition of Jewelry Affaire. It was there that I first discovered Sandra Younger’s cord jewelry, and the brilliant jig she created, the Knotty Do-It-All. As soon as I saw her work, I realized that I just needed to redirect my creative energy with some new media and techniques. I’ve dabbled with cord and macrame techniques in the past, but it’s been years since I’ve worked with jewelry cords. It turns out that the range of jewelry cord on the market today has come a long way in those years. It has a much more pleasing aesthetic that is a far cry from the cheesy macrame styles of the 70s and 80s. 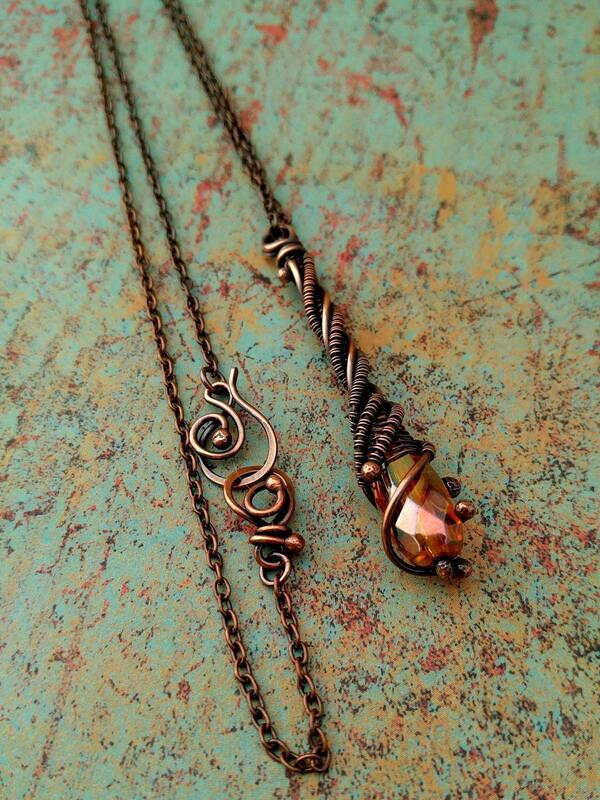 Sandra Younger’s cord jewelry is just similar enough to my own rustic wire-wrapped jewelry style to be a complimentary addition to my design toolbox, and the thrill of learning some new techniques along with the excitement of using a new tool has reignited my creative urge. My husband got me a Knotty Do-It-All for my birthday in August (am I the only one who reads that as Naughty Do-It-All in my head? ), and I’ve been having a blast learning to use the tool to its full potential. I still have much to learn, but I’m enjoying the heck out of the learning process. It’s not perfect, and please excuse the poor photo quality–I snapped these quickly with my cell phone before gift wrapping the necklace. A trained eye will notice a couple of mistakes, and there are several things I’ll do differently as I begin to integrate cord with my usual chain mail and wire wrapping techniques. 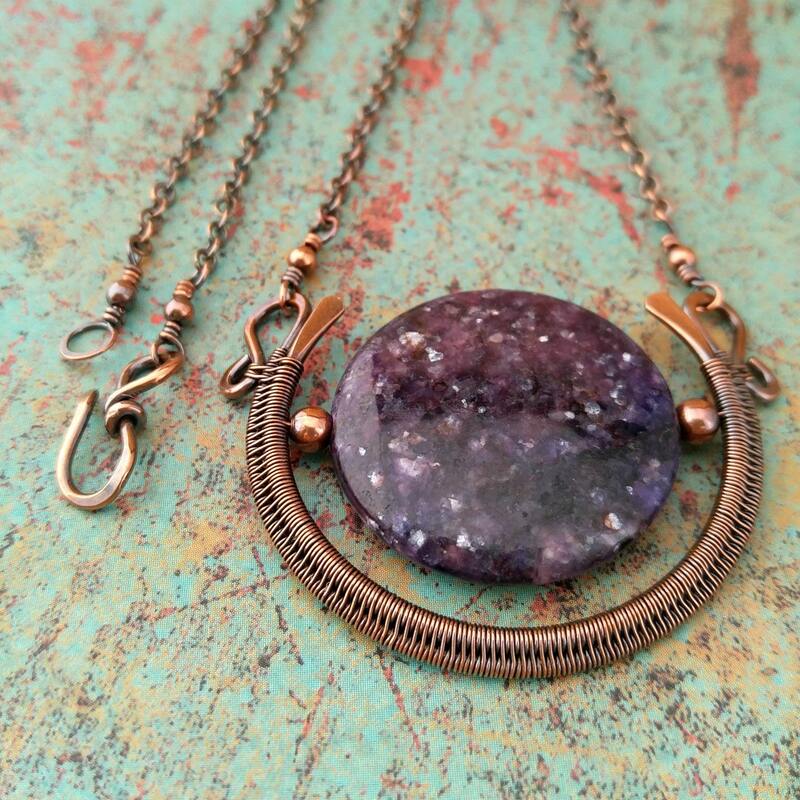 But I think this necklace, which Jenn loves, is a pretty good starting point for some fabulous new jewelry designs that are now simmering in my brain. Thank you, Sandra Younger, for helping me redirect and refocus my creative energy with your fabulous tool and gorgeous jewelry!